In memory of the children of Paris, deported to Auschwitz,1942 to1944. Anne Frank Center USA, 44 Park Place, New York, NY 10007. Between 1942 and 1944, more than 70,000 French Jews were sent to the Nazi death camps; fewer than 2,500 survived. Among those deported from France were 11,400 children; this number included more than 6,000 Parisian children, the vast majority of whom never returned. Following the Liberation of Paris, plaques appeared throughout the city commemorating the heroes and victims of World War II. There are currently more than 1,000 such plaques in Paris, all of which are very moving, and cause Parisians and visitors alike to pause, at least momentarily. Among the plaques are 300 black slate memorials that have been installed since 2001 on the facades of schools throughout Paris. Installation of the plaques was initiated by Mayor Bertrand Delanoe, along with several Jewish organizations, notably L’association Memoire Juive de Paris, which is associated with the Shoah Memorial. The plaques tell the story directly and succinctly, not only asking us to remember the murdered children, but admitting the responsibility and complicity of the Vichy Government and the French police. This exhibition, entitled A la Mémoire des Enfants Déportés, is dedicated to the memory of the children of Paris. This ongoing series of works on watercolor paper features layers of paint and ink, and a method of writing and re-writing the texts in a variety of styles, ranging from traditional calligraphy to more expressive gestural lettering.The 21 paintings on view at The Anne Frank Center USA in Tribeca, utilize media including gouache, acrylic paint, watercolor and ink on watercolor paper. EleanorWinters is a calligraphic artist who divides her time between Paris and New York. 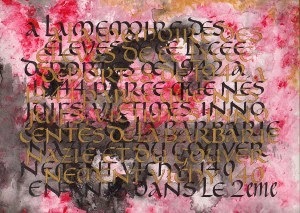 After reading and reacting to the hundreds of commemorative plaques around the city of Paris, Eleanor began to work on a series of calligraphic paintings, using the texts from the A la Mémoire plaques as the inspiration for and the content of the paintings. Her purpose has been to express the gravity and emotional impact of the texts through calligraphy, color and texture. A commercial and fine-art calligrapher since the 1970s, Eleanor is the author of five calligraphy books and teaches classes and workshops internationally. She served as Director of the Calligraphy Workshop division of the New School University for 25 years and is currently an instructor for the Society of Scribes in New York. Her artwork has been exhibited in galleries and museums in the US and Europe, where additional exhibitions of A la Mémoire are currently in the development stage. communities in the U.S. and Canada about the dangers of intolerance, antisemitism, racism and discrimination, and to inspire the next generation to build a world based on equal rights and mutual respect. The opening reception is free of charge and open to the public.